Some photos from the final furlong….. The long straight road across Wyoming’s Great Basin. We walked 23 miles in a straight line on this day….. The sun and lack of shelter required some novel solutions. In this case lunch was under the tent propped up to allow the wind to flow around. Surprisingly- it worked! We reach the 2000mile mark and celebrate with some artwork using local materials and powerbars! 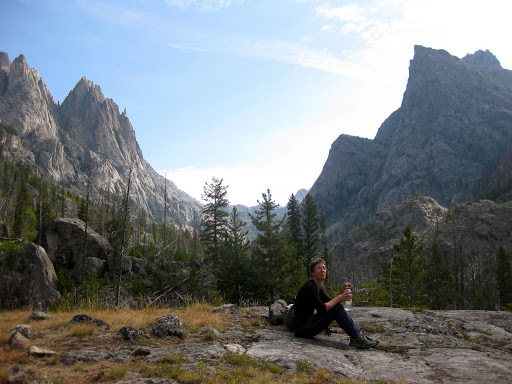 Martina at our finishing point on September 26th- Battle Pass Wyoming. 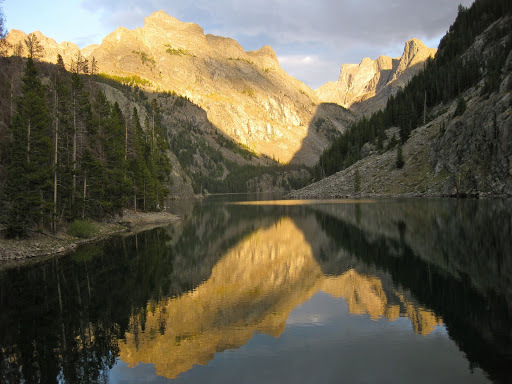 The next challenge was to make it to Denver , Colorado- it took four hitch hikes and two buses to get there. Ready for a rest…….! From the lofty Wind River mountains we were washed into the Great Basin of Wyoming by a spell of wet weather. The Great Basin is a curious natural feature where the Divide actually splits in two: in the basin itself, water just goes “down” and seeps into the ground. Mountain ridges either side of it shed the water into Pacific (Green River) and Atlantic (Sweetwater River and Platte River) respectively. What falls in between just soaks in! It is a high plateau covered in silvery sage, inhabited by antelope (more of these later) and wild horses. No shelter, no people, no towns for mile – and very little water. 120 miles of this – our final challenge! After a recovery stop in the town of Lander (home that weekend of the annual “one-shot-antelope-hunt” – it seems we were lucky to get a motel room!) we headed into the sage desert in bright sunshine. Here we crossed path with the Oregon Trail, the Overland Trail, the Pony Express and the Mormon Trail – thousands of hopeful souls who crossed these waterless plains in search of brighter futures in the 19th century. Now there’s just a big network of trails for the benefit of people who want to shoot wildlife it seems. The pronghorn antelope isn’t one (an “antelope” I mean), actually. It’s the only exponent of a family of ungulates unique to the USA and wonderfully adapted to being on every predator’s dinner menu between the ice ages: it is the fastest runner in the Western hemisphere at 60 mps – and not just for a sprint but for about an hour solid if necessary – it has very sharp eyesight and can spot things at 3-4 mile distance (or so I read on the WWW), it is certainly very wary of two legged animals walking towards it – we never got closer than 300 meters to any of them. Unfortunately it doesn’t seem concerned about things on wheels (a bit like the sheep on Skye) which, given that your average American hunter shoots from the truck window, is rather a shame for the species. They also are the only animal that grows proper horns (as opposed to antlers) and then sheds them every year. We didn’t find any though. On day 3 in the basin we camped by a little cow infested yet promising spring under benign cumulus, tent turned into a mild Westerly evening breeze – only to wake 2 hours later to the tent being flattened by a northerly gale with snow … bell-end departed company with the pegs and someone (a man’s job this, surely) had to go out in the lashing storm (in underpants) to re-peg the whole mess. The next morning, snow lay on all the hills around us and an icy northerly continued to blow us infront of itself down the endless straight jeep-roads that serve as the CDT in the Basin. This morning, we descended from our last Divide peak (Bridger Peak 11,000ft) to a trail head at Battle Pass. 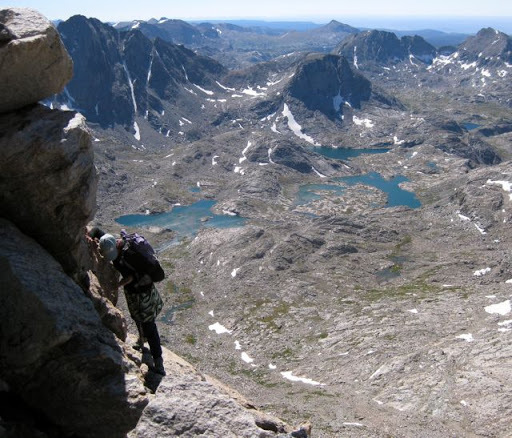 This is the pass where we set out in 2004 on a 300 mile taster-hike along the CDT, the end of which was Dillon Lake in Colorado (where we started this year’s Colorado Southbound hike) … sigh … sorry to be so complicated. The upshot is that this morning we completed to make a set of footsteps between Mexico and Colorado on the CDT (with 300 miles of steps from 2004). This year we have walked 2,100 miles. Thanks to all the lifts and support and spontaneous help we have had. ps thanks to Tom and Debbie , Florida for the rare photo of the 2 of us hiking…. We pride ourselves in pitching the tent quickly, but maybe not this speedily !! 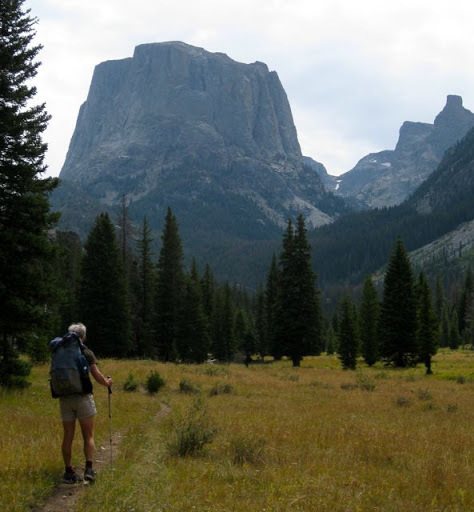 Our trek along the Wind River mountains of Wyoming has now been completed. We made it to the southern edge of the mountains in prairie country at South Pass City. Its been a great hike taking about 11 days. The supermarket in Pinedale, Wyoming shows that we are in hunting country………..
And autumn is on its way…. Our tent (middle bottom of photo) lost in granite slabs, lakes and mountains. Spider Lakes, Wind Rivers Wyoming. Martina makes a river crossing with Warbonnet Peak looming above. We approach the Cirque of the Towers looking like the Skye ridge in Scotland – with Scottish weather. Cirque of the Towers. Two classic rock climbs here- Pingora Peak’s right hand skyline and the Wolf ‘s Head in the middle. Some close up shots in the Wind Rivers – primrose,lichen columbine. And Brian hitching from Jackson back to the trail at Togwatee Pass, Wyoming- the Grand Tetons provide a nice backdrop while we wait! 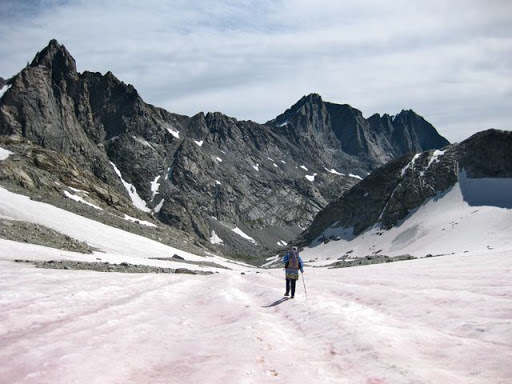 Here are some shots from the Wind Rivers which give a flavour of our hike including an ascent of Fremont Peak…..
We have just returned from 6 days of walking through the Wind River mountains. Again we spurned the CDT propper for a more adventurous and wilder route, but moving steadily South. 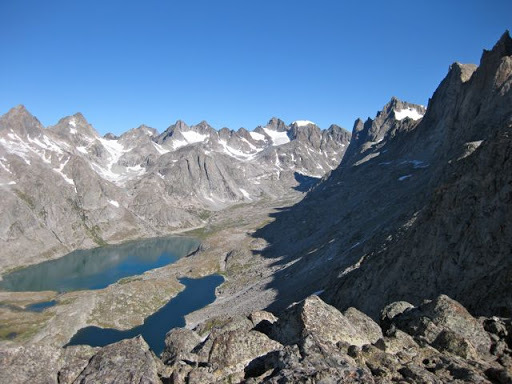 We started out in the town of Dubois (pronounced: Doo-Boys) and after aprox 15 miles of trail into the Fitzpatrick Wilderness, left preformed trails and notions behind and headed straight up Shale Mountain over a wild, broken plateau of tortured looking granite slabs and not much else. It was freeing to be rid of the trail! 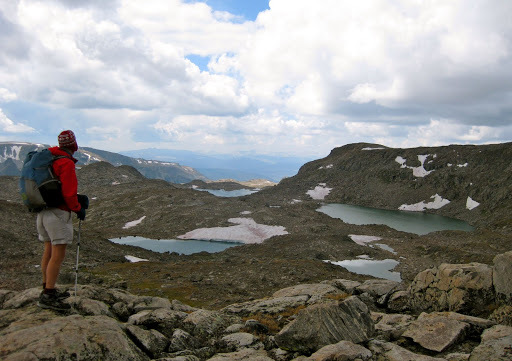 Our route led through wildly undulating landscape past deep blue lakes rimmed by snowpatches and steel granit slabs. Every 20 minutes the views changed completely. Small alpine flowers gave it their best before the onset of winter: purple primroses, alpine asters and sunflowers. One afternoon a thunderstorm brewed above our heads and out of nowhere, lightning struck a cliff 200 meters above us. We could see a small cloud of smoke or rockdust followed by a chunk of rock tumbling into the valley. The electric discharge increased our walking pace valleywards considerably. We spent fun hours bush-wacking through blowdowns and burns until we got to the valley of the Green River and the Green Lakes. The river eventually joins the Colorado (in the state of Colorado) and flows to the Pacific – or rather it doesn’t make it there for abstraction and damming, but that’s where it is headed. 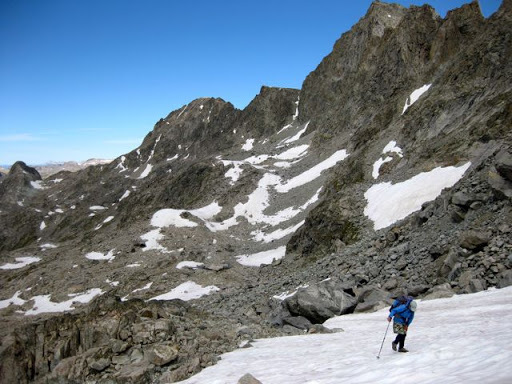 From the Greenriver Valley we crossed into the stunningly jagged Titcomb Basin via a coll called Knapsack Pass which sounds like fun and picknicks but turned out to be a pretty hair raising lose-boulders and semi-frozen scree affair. 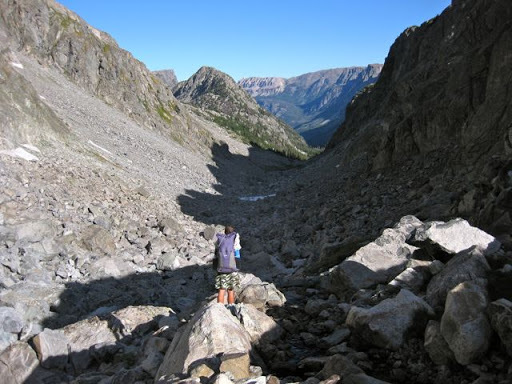 Luckily the glacier hanging under the far side of the pass had retreated and softened (thank you global warming) significantly and we were able to leave the tottering boulder fields and run down the ice (much safer). 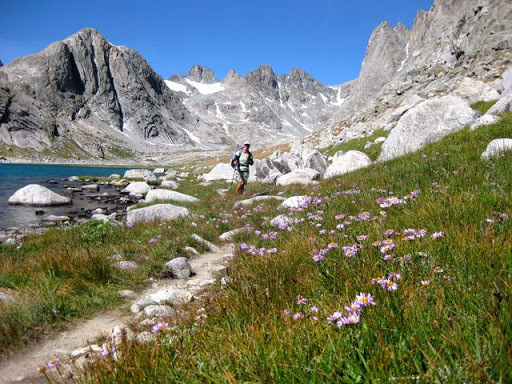 In Titcomb Basin (did I mention it is very beautiful?) 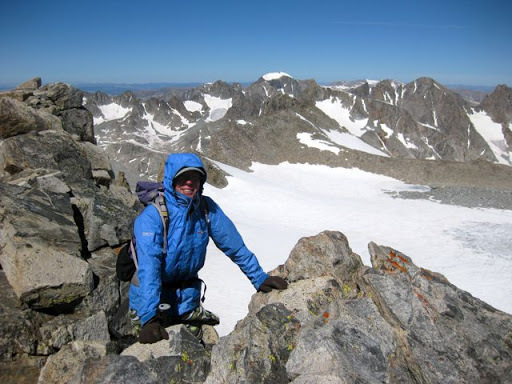 we made a base-camp and the next day climbed the 2nd highest peak in the Windrivers: Fremont Peak at 13700 (or there abouts – map and guidebook could not agree on its actual hight) to gain wonderful views of the area (did I mention it is VERY beautiful?). There was a puzzling absence of wildlife in what is a huge wilderness area. None the less we saw 2 moose, an osprey carrying a fish, the first marmot (yellow bellied) since Glacier National Park as well as the usuals small friendly mammals (Pika, Chipmunk)…and a dead horse (!?). PS: that is NOT one of our photos thank goodness! We’ve still not seen any bears though lots and lots of signs of their omnipresence! 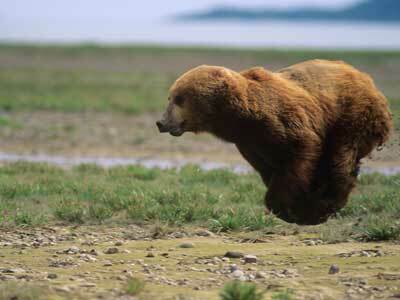 We are now heading South and up (in terms of elevation) and will soon be out of range of the Grizzly bears. The one above is shown in full flight – they can sprint at 30 mph apparently!